[The only problem I had with my 28 new teeth was an incisor that kept on losing its crown. UPDATE. RETURN TO COSTA RICA. Hi guys! I promised to post updates on any development, good or bad. So here goes. It looks like I'll be heading down to C.R. to see Dr. Prada again. The crown on one of my front teeth (the upper-left lateral-incisor) fell off. This was the second time in six months. Something isn't right. Fortunately, this is the only tooth I've been having problems with. There are explanations: the short prep (not Dr. Prada's fault), my bite, whatever. I am *not* happy to have to return to C.R., but I don't trust the local guys to fix it. The tooth doesn't hurt, which is a blessing. But it could means that the pulp is nearly dead. I suspect that it may need a root canal and a post. Dr. Prada said he'd fix it for free, charging me only for the lab work (about $300) if I need a new crown. He has been unfailingly prompt in responding to my emails. But I'm not a great advertisement for him with a missing front tooth! This hiccup hasn't changed how I feel about Dr. Prada. (Skeptics should note that the tendency is *always* for patients to love their dentist even at the price of explaining away faults.) He made a full mouth of crowns for me in 2011, which solved many problems I was having. I still recommend him. In fact, one of my friends is also planning to visit him. I'll try to persuade her to post progress reports. I've been to his clinic four times already, so a report from fresh eyes might make for interesting reading. Thanks for all your great posts Joe, Dog, Tamale and others! These are a great resource and encouragement to others needing quality dental care. Let's make it a custom to post yearly updates around May 1 so readers can find all our progress reports clustered together. TMI? For some Questions and Answers with Dave, Press Here. My posse arrived in Costa Rica Sunday, converging on the Villas del Rio hotel, where we all crashed into bed and slept until Monday for lack of sleep the night before. This is the hotel right across the street from Dr. Prada’s Escazu office, where we’ve been camping out for most of Monday and Tuesday. (This is a convenient location because some members of my posse needed to be squeezed into Dr. Prada’s schedule. Being nearby, it makes it easy to respond to new openings in his schedule.) So I wanted to fill folks in on our first week of dental treatments with Dr. Prada and his associates. But first I wanted to put in a good word about Dr. Obando (Nova Dental), Euthie’s dentist. Euthie and his Mom came over to our place Monday night for socializing and swapping stories about dentists. It was an odd conversation for anyone not a part of the dental-patient underground. But it was great to be able to speak freely about our dental experiences. Whenever I post on this board I feel a need to self-censor myself lest I offend some reader who might be skimming by. In face-to-face encounters, talk flows more freely. Euthie showed us his four new upper front teeth. They looked great! The material was e.max and the price was also great ($415/per). When I ran into Euthie Sunday night, he had a conspicuous gap between two of his front temporaries (which were cast to look like his original teeth). It must have been an eighth of an inch wide. When I saw him Monday night, the gap was completely gone! And the teeth on either side looked both symmetrical and natural. I have no way to check the margins of the crowns (their fit against the root), but everything that I could see indicated that his dentist did a great job. He and his Mom had other work including implants and composite fillings. We got together again tonight, and all their work was completed. We hope he keeps us informed. By the way, “Euthie” is a real person, a regular dental patient seeking adventures and dental refuge in Costa Rica, just as I am. I first posted in August 2011, a few months after finishing my dental work. For a list of my earlier posts see p. 200, #4084. Euthie is a good example of my idea of a successful medical tourist: He did his homework, and is now reaping the happy results. He thanked me for my posts on this board, which gratifies me. He found my post about how to use Google to search the Topix board especially useful—I always thought that would be one of my most useful posts. He invested a lot of time in researching—I think this is necessary—and narrowed his search down to three well-researched dentists whom he contacted for in-depth assessments. I like to have dentists other than Dr. Prada’s clinic to refer folks to, and Dr. Obando might be a “keeper”. As most folks reading this board are very value minded, and I don’t want to appear that I’m pushing my own relatively high-priced dentist onto folks. Euthie said that there were about ten folks back in Canada who are breathlessly awaiting his return from Costa Rica with his new teeth. I suspect that many of them will be following in Euthie’s footsteps to Dr. Obando. In a future post, I’ll report on our progress with Dr. Prada. Now a wrap-up of what is happening to my sister and me at DDS, Dr. Prada’s clinic this week, two years after my full-mouth restoration with him in April 2011. My friend (and her son) also saw dentists at the clinic. She wants to report their experiences in her own post, hopefully in a couple of weeks. This post and the next are going to be even more windy than normal—this is a feature not a bug. Some folks appreciate the little details; they even appreciate too much information if it is about an issue of interest. Just skip over the parts that aren’t relevant to you. APPOINTMENT SCHEDULING. Dr. Prada and his associates run a typical clinic with scheduled appointments. They bent over backwards to accommodate my sister and my friends, who needed a lot more visits than they expected. Getting dental work abroad requires flexibility on the part of both patient and dentist. They fit us in during cancelled appointments and for the first and last appointments in the day. Staying at the hotel across the street allowed us a lot of flexibility to work into the dentists’ schedules and to make appointments on short notice. Dr. Prada told us to allow a week for all the work. We decided to stay an extra couple of days, based on my previous experiences. We’re glad we did because at the last minute we were joined by my sister and my friend’s son. We lost Friday to a big national holiday, which was unexpected. We could have made use of the additional day. A cell phone is really useful in a situation like this, but we relied on one of us four being in the room to answer the phone calls with appointment re-schedulings. (3) the prep could be extended under the gum line to better support the crown. Dr. Prada said that (1) was true, but not (2) or (3). It was true the prep was short; this was obvious. My teeth were always short. When a local US prosthodontist fit them with crowns in 1995, there was only enough tooth length for short preps. I told Dr. Prada that crown made in 1995 for the upper left lateral incisor had never fallen off. But this newer crown was much longer than the older crown. When the lower incisor contacts the upper incisor during eating, the latter tooth is pushed outward. The additional length of the teeth increases the leverage on the upper incisor, which can push the crown off the prep. Dr. Prada laid out two alternatives: (1) a conservative approach involving re-doing the crown, and (2) a more surefire approach requiring a root canal and a metal post to securely anchor a new crown. I had two hours to choose. After a brief Internet search, I decided that I didn’t want to risk a root canal treatment (RCT) on a healthy tooth. I told Dr. Prada that I’d take the RCT and post ONLY IF my x-rays showed that ANOTHER tooth also needed a RCT. But otherwise I’d go conservative. Dr. Prada reviewed my x-rays and said that everything was good. So, the conservative approach it was. Dr. Prada worked on building up the short prep Monday afternoon. He works quickly, but he spent a full 45 minutes on just this one issue. Time and again, he would apply resin (bonding) to the prep, shine an UV light to harden it, and then shape it with his drill. The new prep was a marvel to behold (if you’re into such things): It was bright white, maybe three millimeters longer, a millimeter thicker and with perfectly parallel sides to hold the crown. The other trick he did was to make the new crown thinner to “remove it from the occlusion”. An incisor on the jaw normally just barely touches the back surface of this upper incisor when my jaw is closed. By making the upper incisor a little bit thinner (a tenth of a millimeter or so), the lower incisor would no longer touch it, thereby reducing the lateral pressure against it. I thought it was a clever and resourceful way to leverage the strong Prettau zirconia material of the crown by pushing it toward its minimum limits of thinness. All told, Dr. Prada spent at least an hour and half Monday on me discussing and addressing this issue. The old crown was sent to the lab to serve as a color guide. The new crown will be ready Monday, and Dr. Prada will adjust my night guard too. Dr. Prada promised that he would charge me only for the lab services to re-make the crown, about $300. Woody: We'll miss you on this board. Please check back with news. Personal preference: I didn't want to do my first root canal treatment (RCT) on a healthy tooth. I did a little Internet research, and learned that RCTs are yet another issue where some holistic-type dentists disagree with the dental establishment. You can Google "root canal treatment" yourself and see the types of charges and counter-charges that are being bandied about. I don't know who's right, but I did respect the fact that some of the dentists that I generally look to for advice (e.g., Mark Breiner) have reservations about these treatments. The root of the tooth with the loose-crown problem was healthy. (Dr. Prada said that a root is either viable or not viable; as long as there is circulation it's fine even when the tooth has lost sensitivity like my tooth had.) The RCT would have allowed a permanent fix to the problem of the crown falling off. The metal post would be much longer than the little stub of a tooth that has been trying to hold onto the crown. But to get the metal post I would need an RCT since the metal post is stuck way down deep into the root. So, did I want to do a RCT on a healthy root just to hold in a crown? I do not have any RCTs in my mouth. My roots are very healthy, it was only the tooth enamel that had problems (tetracyline staining, like my sister's, and also grinding). I decided that I didn't want to have a *new* dental procedure in my mouth if I could avoid it. However, if I needed an RCT for ANOTHER tooth, then I would probably go ahead and do an RCT on this tooth too. Convoluted reasoning, but it's how I think about these things. I've had a lot of problems with dentists and their treatments, and tend to shy away from unnecessary risk. It's good that you're paying attention to the smiles that you see in the media. This counts as research! Your fascination is healthy; I agree with OKJoe on that. Many/most of the photos are retouched to make the smile unnaturally white. It becomes part of our visual culture to think of a nice smile as being unhumanly white. Most dentists and physicians find this color unattractive since they see real teeth all day long. But the rest of us subconsciously accept the idea that nice teeth are refrigerator white. Real teeth come in several different hues (yellow, bluish, gray, reddish) and usually shade subtly from the root to the tip. Photo-retouched teeth are bright white with no such shading. Just look at your friends' real teeth and compare them with the "perfect" smiles in your glossy magazines. They are totally different. A few years ago, when the dental labs weren't as sophisticated as now, many crowns for front teeth were made almost identical: the "picket fence" effect. Once you knew what to look for, you could pick these right out on Hollywood movie stars. Now, fortunately, the better dental labs will make the crown for each tooth look like the natural tooth. I mean, the incisors on the top are totally different in shape from the incisors on the bottom. And the bicuspids (canines) are totally different beasts than the incisors and premolars on either side of them. And so on. Progress means that the picket fence smile isn't seen as often. At least in Hollywood. You really don't want white picket fence teeth, unless you don't mind those of us in-the-know snickering behind your back. My sister completed dental work with Dr. Prada this week. She scheduled at the last minute and that for a consult only. But when she decided to go ahead with work, Dr. Prada was able to fit her into his schedule on short notice. (Just for the record, I don’t recommend doing this as a matter of course: there might not be any appointments available to you. Our ten-day stay across the street from his clinic allowed time for a lot of improvising.) I’m encouraging her to post for herself. “INFECTED” IMPLANT. My sister was concerned about an implant on her left upper central incisor. The dentist who implanted it and a second dentist. both agreed that it was infected and needed to be replaced. (The original implant operation was performed in Indiana, not California, as I might have posted earlier.) Dr. Prada examined the implant and recent x-rays. He said the implant was fine and did not need to be replaced. (1) The high and somewhat unsightly gum line above the implant. The Indiana dentist had badly misjudged the positioning of the implant. He had to cut out at least one-eighth of an inch from the gums above the incisor. This made the implant stand out. Worse, it made the entire upper gum line very asymmetrical. (2) The crowns on the four upper incisors were not well matched in color with either each other or the other natural teeth. Later on, Dr. Gonzalez examined my sister. He agreed that the implant was healthy and concurred that it would be a complex and expensive process to fix the asymmetrical upper gum line, though he could do it. (2) Bonding. As a more conservative alternative to crowns, bonding would not require the grinding down of the tooth. Dr. Prada applied some bonding to one of the teeth to show what it would look like. My sister chose bonding on eight lower front teeth. This was the more conservative, less expensive option, and she had had good experience with bonding years before. The price was $285 per tooth in this case, but I’m sure the price would vary depending on exactly what needed to be done. There are different ways to bond teeth, and Dr. Prada had a technique I had never heard about before. The work was performed in two visits totaling about three hours in the chair. Dr. Prada ground off a thin layer from the front of each tooth to allow room to add the bonding. He knew I was interested in the details of these dental procedures, so he explained to me that this was a typical prep for a “conservative veneer.” “Conservative” means that not much tooth structure is removed. Then he applied coats of a special bonding material. It applied as a blue ink-like liquid, but under intense UV light, it solidified to white. He said that this bonding material was very opaque and would help hide the brown coloration of the natural teeth. It was as if he had given her thin, opaque, white veneers. He spent time shaping each tooth with a burr (“drill”). In the end, each tooth looked perfectly natural. The newly treated teeth were grayish, which was fine as they matched the other teeth. My sister was very happy with the work and she has begun to smile with her lower lip again. I think that it will take a few weeks or months for her to get fully used to her new smile. Yup. "Mooch the cat" is my sister, alright. Mooch thinks my posts are too wordy, and she wanted to show me how to shorten them. I didn't realize she had tried bonding on her lower teeth before. She said the earlier dentist used a yellow bonding material and the teeth weren't shaped well. So she had it all ripped off. By the way, the location on the post is correct. Our hotel is in Escazu, right near the clinic. Woody and RJ: Thanks for your nice compliments. I'm purposely detailed because I think that's what people find most useful. I mean, if you're interested in the topic, you just can’t get enough detail. And if you're NOT interested in the topic, then you're going to skim the post anyway, regardless of how short it is. Now onto Woody's good question. A disclaimer: I'm just a patient, not a dentist, so I'm certainly not qualified to give Woody or anyone else advice for a particular case. However, I have learned a thing or two in my sojourn in the Dental Underworld, a vast, bleak realm which certainly takes in much of the U.S. too. So, let me try to pass on my story and what I've learned in a way that might be of some use to readers. I would never have known about this except for a great local periodontist: Dr. John Moriarty in Cary, N.C. (His associate is supposed to be great, too.) Dr. Moriarty was the long-time chairman of the Graduate Department of Periodontics at the UNC School of Dentistry. He helped train a generation of periodontists—-graduates of a 2- or 3-year, post-DDS program in periodontics--and was partly responsible for the great reputation of the department. So I'd like to give him a special shout-out. I asked him why he was still practicing so long after "retirement," and he said that he loved his work. He is certainly worth going out of one’s way to see for a second opinion. 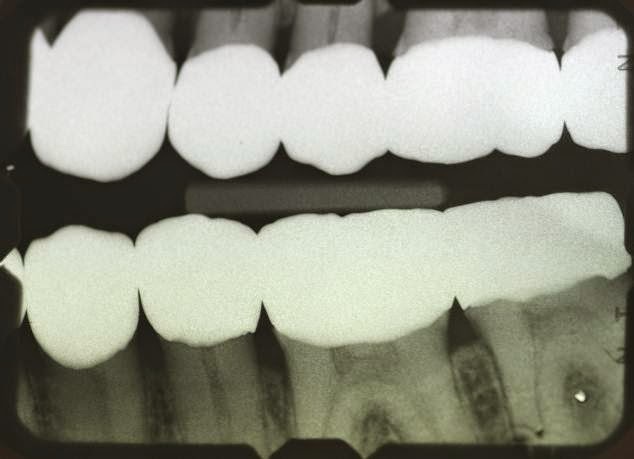 The purpose of crown lengthenings in my case was to make the “preps” (tooth stubs) longer, which would allow for better shaped and better fitting crowns and hopefully ease the gum inflammation I experienced with the 1995 set of crowns. (This plan worked.) My teeth had little enamel, but great roots. If my roots were shallower or weaker, this plan might not have worked. TO LENGTHEN OR NOT TO LENGTHEN? One of my reasons for my fact-finding trip to C.R. in November 2010 was to get second opinions on the necessity for crown lengthenings. For one thing, it’s expensive. In the US, the quoted rate was $200/tooth, but I think there is some flexibility in this. Dr. Gonzales did all 28 teeth for well under $3,000, and the anesthesiologist was another $500. Both did an excellent job. With the benefit of hindsight, I know that the warnings against crown lengthenings IN MY CASE were unfounded. But at the time, I was totally confused. I was an unhappy resident of the Dental Underworld. It’s also possible that the general dentists didn’t realize how short my existing “preps” (tooth stubs) were. Once the old crowns were removed, it was obvious. But it’s not so obvious when the preps are covered by crowns. I did try to tell them that my preps were very short, though. Dr. Gonzales understood the reason for the crown lengthenings, and he was specially trained to perform them. He had excellent post-graduate training at Baylor. Apparently, crown lengthening procedures aren’t taught in every periodontics’ program, and I was fortunate to have found Dr. Gonzales. I concluded that specialists and non-specialists approach dental problems in slightly different ways. This realization startled me in 2010, and it startles me still today. But otherwise, how to explain why some general dentists do the things they do unless it is because—-as a group—-they simply hadn’t been trained deeply enough in one or more of the dental specialties? I guess I’m saying that there are complicated cases that general dentists and specialists—-in the US and Costa Rica alike—-will approach differently. I don’t know how frequent these disagreements are, but I suspect that general dentists and specialists are working for slightly different purposes and/or clienteles (again, in both countries). I think that general dentists are trying to get things done as expeditiously and inexpensively as possible, and that specialists may try to perform the “state of the art” techniques on patients who can afford it. I expect that not everyone on the Topix board will agree with this. And of course I could be totally wrong; it would not be the first time. But it’s how I see things now. So, Woody, what does all this mean for your particular case? First and foremost, I’ve tried to make clear that I really can’t advise you here: I’m not a dentist. I’m not even sure that permanent crowns will fit the gums like the temps do. I suspect that they might, but you really need to ask your dentist about these things. As I remember, you are going to the Cavallini clinic. I VAGUELY remember from my visit in November 2010 that they have the infrared laser I mentioned. The laser is quick and quite inexpensive, by the way. And it wouldn’t surprise me if they had seen a LOT of patients with issues very similar to yours. Your dentist can certainly give you a more informed answer than anything I could offer. I don’t think you should worry. But if you are worried, get a second opinion from a good--hopefully great--periodontist. And if his answer should differ from your CR dentist’s, well, welcome to the Dental Underworld! Now you will have to decide for yourself who’s right. Hope this helped! But, honestly, I think that your dentist has successfully handled many, many patients with whatever is troubling you. P.P. : By the way, my sister took her nom de blog “Moochthecat” from one of her pets. I don’t think she ever heard of “Morph the Cat,” but I’ll ask her. Hi from Costa Rica, LadyD! As for a recommendation for the best dentist, that is a personal decision. There are a few excellent dentists that are perennial stars in our discussions. It's a good idea to read the last 30 pages or so of this blog (and the accompanying blog) to get an idea of the lay of the land. Today is my last full day in Costa Rica, and the weather was lovely for most of my current visit. Yeah, it rained in the afternoon most days, but it didn't inconvenience me. Low 70's most days, and today and yesterday it didn't rain at all. Glorious. My posse is leaving for home tomorrow, so this will be my last dispatch from C.R. I have a little update to add to my story. I went in yesterday to take delivery of the new crown—only to find out that I needed a root canal treatment (RCT) after all. I got the RCT yesterday and the new crown today—the same crown I tried on yesterday—on a metal post. It certainly wasn’t what I hoped for or expected when I got up Monday morning, but such is life. Dr. Prada worked for over an hour last week on a beautiful “build-up” treatment for the short “prep” (tooth stub) on my upper left lateral incisor. He would not have invested so much time unless he fully expected it to hold the new crown. In my visit Monday morning, he spent almost half an hour adjusting the crown—pushing it onto the prep and taking it off—time after time. Somewhere in the process the build-up became detached from the prep. He had a sly way of breaking the bad news to me. After finishing the adjustment, he handed me a mirror and said that there was good and bad news. I looked in the mirror and saw the new crown which blended in beautifully with the other teeth. He pointed to two minor imperfections—which were scarcely noticeable—and mentioned that the crown would be sent back to the lab to fix the imperfections and for final polishing. Then he took the crown off and let me look in the mirror again. Instead of the big, white prep of last week, I saw the old dark mahogany prep. My heart sank. It was a wordless let-down. He said the only remaining choice was to get a root canal to prepare the tooth for a metal post. He scheduled me for later that same day with his endodontist for the RCT, and for the following morning (today) for the post insertion and crown delivery. It was great that he could work me into his schedule on such short notice, but I was still philosophically opposed to a root canal—my first—and on a healthy tooth no less. People sometimes wonder about sterilization procedures in Costa Rica—there must have been some awful reports years ago—but I can say that everything was autoclaved and placed in separate packages. This is not atypical—the other clinics I visited in November 2010 were the same way. After the RCT was finished, I paid the bill and immediately left for a tour of San Jose with my friends. There was no pain, so I did not take any pain relievers. (I’m feeling a little bit of tenderness in the gums in that area now, so I might take some pain relievers later on tonight.) The procedure cost $270, but this was for a simple tooth, an incisor. I suspect that molars might cost more, but I didn’t ask. I was more concerned about the possible ramifications of the RCT than the procedure itself. As I mentioned in an earlier post, I was very wary of trying any new dental procedures, a fear arising from previous bad experiences. I also did not want to kill an apparently healthy tooth. I discussed my concerns with Dr. Caranza before the procedure. She was very patient with me and took about 15 minutes allaying my worries. I also learned a few words of endodontist-speak. Endodontists talk about “saving the tooth” which means to leave the enamel and dentin of the root intact but removing the nerve and pulp at the center of the tooth. They talk a lot about this nerve. The nerve can be healthy, dead, dying, infected or in some other state. In reply to a question, she said that the enamel and dentin surrounding the nerve and pulp are already dead, even in a tooth with an intact and healthy nerve. Dr. Caranza said that the nerve in my tooth was mostly dead already. The grinding of the tooth for a crown is thought to be very hard on roots. She explained that the x-ray of that tooth showed no enamel and only half a millimeter of dentin, which wasn’t enough to protect the nerve from bacterial infiltration. The fact that the tooth had no sensation even when the prep was exposed to air and liquids was also a bad sign, as I had expected. I don’t know whether this story was completely frank or not, but it made me feel better. Dr. Caranza thought that the nerve was dying anyway, and would be dead within a few months anyway even with an intact crown. So, I wasn’t sacrificing a healthy nerve to an RCT after all! I was merely killing the nerve before it had a chance to die naturally and get infected. After drilling into the pulp, she said that the nerve was 90 percent dead already. She stuck to her story for the rest of the procedure, so at least I give her credit for consistency. At 9:30 today, Dr. Prada: removed the temporary crown; drilled a hole in the gutta percha in the RCT’d tooth and inserted a metal post; fit and cemented the new crown, just back from the lab; adjusted the bite (“open, close, bite down, move your jaw forward”); and adjusted the night guard he made for me in April 2011. He works very quickly, but it still took him almost an hour. Probably more than that if we include all the time he spent answering yet more questions. Twelve hours later, the bite feels good. But my gums are slightly tender for some reason. It was probably take me a few months to accept my new root canal. I hope that my 27 “good” teeth can hold out for a few more years because I’m not looking forward to a Costa Rican RCT trip every year. No Comment to " My dental work at two years and 2 months (loose crown) "